My sister told me about this anime, and i asked what it was about, and she reply d "food". When she said that i didn't really wanna watch it, but a couple weeks later i gave it a shot, and just wanted to watch more and more. It has a uplifting, yet kinda darkish vibe to it. It's a anime about food, but the twist it that, they actually care, praise and respect the food, as if it were a new born. It made me think about how great food can actually be once you put your mind to it. In the Gourmet World, Food is King! Toriko is made by the same people that gave us One Piece and Dragon Ball Z, so if you liked either of those you will like Toriko. In this world food is king. Everyone loves food and will pay big money to get to try new delicacies. Gourmet Hunters, brave the wilds of the world to obtain the best food. Every time the eat something new they get stronger! Imagine! A place where eating like mad makes you strong! 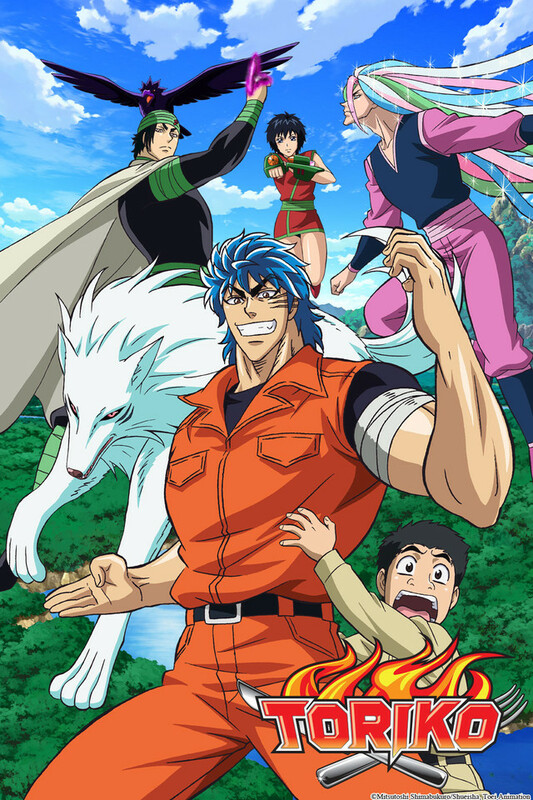 This is one of my favorite animes and Toriko is probably my hero. toriko is currently one of the best shounen around and you will understand why if you watch it ^^ its top ranked in japan and also famous in the west. the plot is very good and the fight scenes are amazing! Toriko this anime makes you hungry!!!! So to start this anime is about food so every time you watch Toriko Get a food and eat while you watch. This has some interesting turn of event which you will gonna see at the middle of the story so I recommend you to watch each episode. Toriko starts off as a light-hearted superhuman shounen series where the main character, Toriko, and his friend Koumatsu set off on an adventure to discover the world's bounties and eat to their hearts' content. The theme song is fun and heroic that is full of energy and reminiscent of many popular shounen from the 80's and 90's. As a series, it holds to the constant idea of wandering around the world to collect delicacies and learning new ways to prepare foods and learning super powers. There's not too much blood, and the characters (for the most part) are typically jolly and high spirited. That being said, no series goes without its flaws and Toriko is no exception. The cast of colorful characters can come off as annoying with their chipper attitudes. Early on, the powers are ridiculous as is, but they get even more ridiculous as time goes on making the super powers a prime focus for many of the audience instead of just exploring the world and having fun. Furthermore, the primary antagonist isn't the world or the monster-of-the-week as the series would have you think. Rather, it becomes a battle of grown men who fight over food because only the good guys seem to want to share. If u like anime where character's powers develop as the show progress,this is a must watch. Th creativity about this so many different types of food;i ended up gaining muscle weight while this show increased my appetite in a healthy way. it has humor,action,superpower,even emotional scenes.I love the beasts they show in the anime,love you battle wolf,Queen,kiss awesome beasts. The powers the protagonist and antagonists have nice job Toriko.Loved and enjoy the show,don't judge the anime before u watch it with open heart. The animation quality appears to have increased substantially from what it was I was in the Four Beast Arc. I even enjoyed these filler episode i.e. episodes 130-131. I am looking forward to seeing how the anime progresses. I started to watch Toriko out of boredom because of its One Piece collab episode. What started off as casual watching (not gonna lie, it was a tad difficult to take seriously at first), eventually led to binge watching. For a shonen series, Toriko is refreshing and original. Like DBZ and One Piece, it still takes longer than necessary for some of the fights. Also like DBZ and One Piece, you see the characters get develop their strength and relationships throughout as well as the numerical "capture levels" attributed to ingredients and monsters. Although the fights involving Toriko show his strength growing much quicker in the second half of the show. The show really picks up after Toriko and Komatsu go to Ice Hell (which is not long into the show). Another the thing the show does well is revealing all of the legendary characters slowly. They don't overwhelm you, giving all of these characters value when they reappear throughout the show. Besides the action, what made me love the show was the creativity in the ingredients, recipes, and cooking. The reactions to the food they ate were always fun to watch and made it rewarding for both them and me. The concept of the Gourmet Age seemed odd at first, but it's very well developed and the different caveats don't take long to grasp. My only note on the ending is that I was very satisfied. Although it was slightly open-ended, the open-endedness has been premised throughout the show by the prospect of the young generation replacing the old. I'd watch 100's more episodes of Toriko, but I'm more than satisfied with the way it ended and think it would only detract from the well crafted character development. Also, Komatsu is one of the most likeable characters in an anime that I've seen in a while.